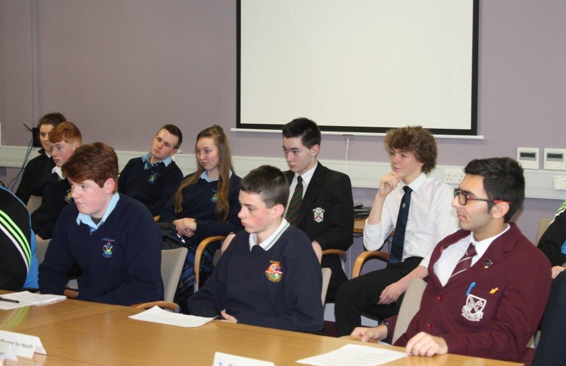 On Tuesday, the 26th of January 2016, Ciara McDonald, Dean Madigan, Owen McCabe, Cian Dillon and I were chosen to go to Armagh for a road safety talk in the North South Ministral Office. It was a very interesting day and we took a lot from it. We arrived at 10:00am and where greeted with tea and biscuits. After a while we went into a conference room and the presentation began. They started by introducing all the guest speakers. The guest speakers were officers from the Garda and the PSNI, also there were firefighters from the Monaghan/Armagh area. They spoke to us about distractions on the road such as mobile phones. They also spoke about driving under the influence of alcohol and drugs and how all these things can lead to death and serious injury on the road. They firefighters then did a demonstration of what they do once they arrive at the scene of a car crash. There was three students nominated to be the victims of the car crash and I was one of the students to be picked. I played the passenger in the front that died. It was a very scary experience when the car was being cut apart to try and get us out of it. After the demonstration we were split into groups and we discussed was to make Irish roads a safer place. That was the last part of the talk. They had food made for everybody there. After we ate we hit the road and went home. It was a very enjoyable day and we learned a lot from the talks. We learned to be a lot safer on the roads and to be more careful when driving.